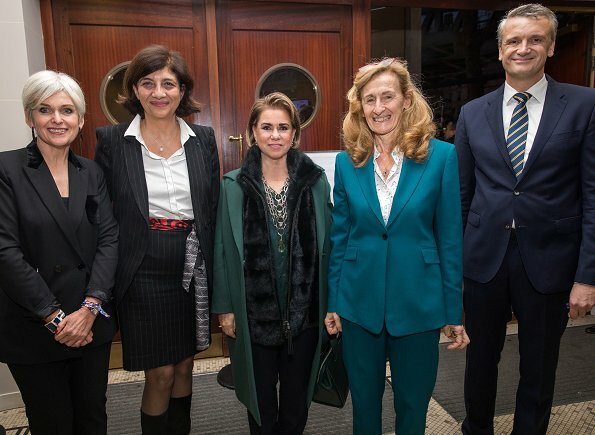 On November 26, 2018, on the occasion of the "International Day Against Violence Against Women", Grand Duchess Maria Teresa and her daughter Princess Alexandra attended the screening of the film "I am Nojoom, age 10 and divorced" in Paris. I am Nojoom, Age 10 and Divorced (Ana Nojoom Bent Alasherah Wamotalagah) is a 2014 Yemeni drama film directed by Khadija al-Salami. The film tells the story of Nujood Ali who sought divorce from her abusive husband at age 10. While MT looks good, the bronzed should be more subtle and her love of chunky jewellery needs to go. How lovely seeing mother and daughter out together for a great cause. But I am not liking MT's make-up again, I think it's the very thick and dark eyebrows that make her look harsh, almost scary. I am not a fan of this trend of thick eyebrows anyway, it could look OK on certain women - usually I find that it works better with younger ones - but it doesn't suit everyone, and MT is one of the latter. Do I spot an engagement ring on Alexandra's finger? She seems a really lovely and intelligent young lady. I would be happy if she had found love. Agree that MT's makeup is too heavy. Overdone makeup ages her face unnecessarily. Alexandra is an attractive natural-looking young woman. La première photo est tellement Photoshopée que l’archiduchesse n’a plus de paupières inférieures. 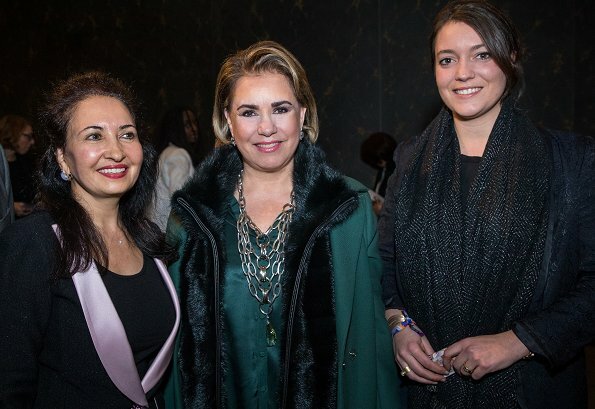 Nice emerald color outfit with matching coat for GD Maria Teresa.Pss Alexandra looks very nice too from what one can see of her attire. Alexandra is a very beauty woman. She has so much of her parents, and her elegance is perfect even in no casual style. A modern Princess with remembrance of the past. She is an intelligent woman, educated and cultivated. She will make so much things for world in the future. Very lovely woman. I like her.